Help Us Get On The Rondo Awards Ballot! The evocative words above have undoubtedly sent chills down the spine of many a reader. They’re said to be from Cassilda’s Song in “The King in Yellow,” Act I, Scene 2. I say “said to be” since the play doesn’t actually exist. Back in 1891, Ambrose Bierce wrote a short horror story called “An Inhabitant of Carcosa,” along with a 1893 story called “Haïta the Shepherd” that made a passing reference to a god of shepherds called “Hastur.” Fellow author Robert W. Chambers decided to pay tribute to him in 1895 by including uses of the terms “Carcosa,” “Hastur,” and “Hali” (a philosopher noted in “An Inhabitant of Carcosa”) in his anthology, The King in Yellow. While Carcosa was used as the name of a city in the novel and Hali became the name of a lake, the use of Hastur in it was far more complicated. In the story “The Repairer of Reputations,” Hastur was the name of a location despite it being given as the name of a character in “The Demoiselle D’Ys.” On top of that, the name is used several times throughout the anthology without explanation, although some think it is meant to represent a star. The idea behind The King in Yellow is that most of the stories involve characters reading or discussing the play “The King in Yellow,” while others seem to treat elements from the play as being real, such as the King in Yellow or the Yellow Sign. Other stories feature samples from the nonexistent play, which in the story is said to induce madness due to its harsh truths about universe. Such a work of horror naturally caught the attention of H.P. Lovecraft, who incorporated references to Hastur, the Lake of Hali and the Yellow Sign into “The Whisperer in Darkness” in 1930 (which was not published until 1931). I know what many of you are thinking: “Ah, so Lovecraft’s inspiration for the Necronomicon was “The King in Yellow!” The thing is, that’s not the case at all. The Necronomicon first appeared in “The Hound,” which was written in 1922 and published in 1924 while Lovecraft didn’t read Chambers’ work until 1927! But what about Hastur the Unspeakable’s connection to the King in Yellow, you might ask. After all, lots of Cthulhu Mythos stories connect the two and tentacled beings in tattered yellow robes are a staple of Lovecraftian merchandising and gaming. What about those stories? The thing is, Lovecraft never wrote them! The creation of Hastur the Unspeakable is due to one August Derleth. It seems that Derleth was quite taken with the Hastur reference in “The Whisperer in Darkness” and, seeing how Lovecraft had seemingly done little to develop “Him Who is Not to be Named” (aka “He Who is Not to be Named”) in his stories, decided to expand upon the concept himself by combining the two. This led to him penning “The Lair of the Star Spawn” with Mark Shorer in 1932, which featured Hastur’s first appearance as an entity in the Mythos. Things were fleshed out further in his 1937 tale “The Return of Hastur,” which introduced the idea of Hastur being related to Cthulhu (he also introduced his infamous “Good vs. Evil” variant on the Mythos in the same story). What Derleth apparently didn’t realize was that, despite Lovecraft focusing more on the character in his letters rather than his stories, Hastur and Magnum Innominandum (which roughly translates as “Him Who is Not to be Named”) are listed as two separate things in “The Whisperer in Darkness!” Despite this, Lovecraft never went out of his way to stop Derleth’s interpretation of the character. The only time he put his foot down was when Derleth wanted to refer to what is now known as the Cthulhu Mythos as the “Hastur Mythos!” In all fairness, though, Lovecraft alternated between seemingly implying that Yog-Sothoth and He Who is Not to Be Named were one and the same while listing them as separate beings in private correspondence. It’s also worth noting that in his short story “History of the Necronomicon,” Lovecraft has Chambers being inspired to write “The King in Yellow” due to the Necronomicon! What about the mysterious high priest whose face is hidden behind a yellow silken mask that appears in Lovecraft works like “Celephaïs,” “The Dream-Quest of Unknown Kadath” and “Fungi from Yuggoth?” Given that it is known as both the “High-Priest Not To Be Described” and “veiled king,” the high priest seems like a good King in Yellow candidate. But, given that the first two works were written in 1920 and 1926 (with the 1929 poem merely referencing those past works), it is impossible for Lovecraft to have based the character on Chambers’ creation. That hasn’t stopped people from linking the two, though. Some claim that the yellow-clad Dreamlands avatar of Nyarlathotep is actually the High Priest. 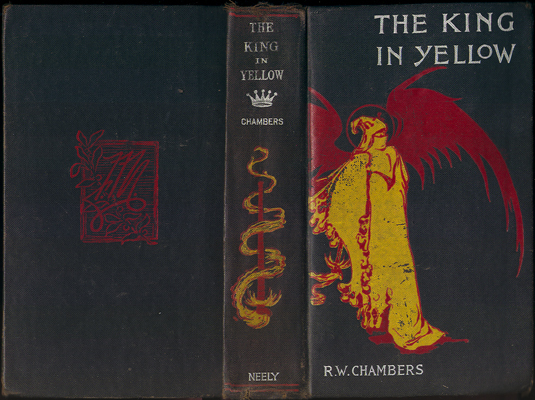 In addition to Chambers, Lovecraft and Derleth, numerous other writers have paid tribute to the King in Yellow in their work. Famed crime fiction author Raymond Chandler even included a reference to it in his short story “The King in Yellow,” in which the protagonist remarks that a murdered man in torn yellow pajamas reminds him of a book he once read! Although most of these works are unable in complete form online, I did manage to find two works to further complement the above-linked stories and prose. First is Lin Carter’s “The Candidate,” a selection from his poem “Dreams from R’yleh” that combines the “High-Priest Not To Be Described” and the King in Yellow. “To Every Thing There Is A Season” by Dru Pagliassotti uses the Hastur interpretation of the King in Yellow in a humorous tale involving Deep Ones. Perhaps the most prolific writer in the field of “The King in Yellow” tributes is Joseph S. Pulver, who has written 30 such works so far. You can learn more by visiting his website.